NixNote Free Note Taking App OneNote Linux Alternative. Formerly NixNote named with Never Note. How to install NixNote as evernote client in Linux? Read it here! This NixNote is of the Linux apps for taking notes easily and become alternative for Microsoft One Note on Linux. This is an open source clone of Evernote. This program has been run on Linux, Windows, and OS-X, but the primary goal is to proved a Linux client. While this is designed to work with Evernote, it is in no way connected with or supported by Evernote. NixNote allows you to create a text note and synchronize it with your Evernote account. You can’t create or edit ink notes. Evernote doesn’t provide an API or any documentation on the file formats for ink notes so there is nothing I can do but vewing ink notes is possible. When you synchronize it should pull an image down and show it to you. The note is read-only and you can’t change the contents. NixNote is designed to interact with Evernote and synchronize any data you have. The first time you synchronize it will download all of your data. The first sync can take a very long time based upon the size of your database. If it encounters problems and crashes on the first sync, you should be able to restart the program and continue the synchronization. It will take up the synchronization where it stopped. If space is a concern, you can choose which notes you wish to synchronize. It is easiest to do this before the first sync, or you’ll download everything in your account only to delete it later. If you have already synchronized and wish to use this feature you can do it at any time. When you use this feature NixNote will still download all notes just as if you were doing a full synchronization, but it won’t save any notes matching your criteria. It will also allow you to create any notes with those tags & notebooks and will store them until you synchronize. When you synchronize, the note will be uploaded & deleted from your local database. They should then be available online. Notebooks on NixNote can be created or renamed the same as any Evernote client. When you create a notebook you have the option of creating it as a local or synchronized notebook. Local notebooks are saved only on your hard drive and never go through Evernote’s servers. If you local notebooks I highly recommend doing frequent backups to preserve any data in the event of a crash. After downloaded, double click that file and new window will appear. Click on "Install Package" button and enter your password when prompted. 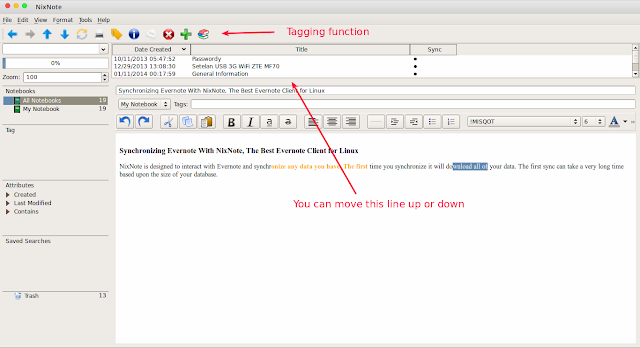 NixNote provide great functionalities for note taking apps on Linux. It is the best Evernote client since Evernote doesn't provide official program for Linux. 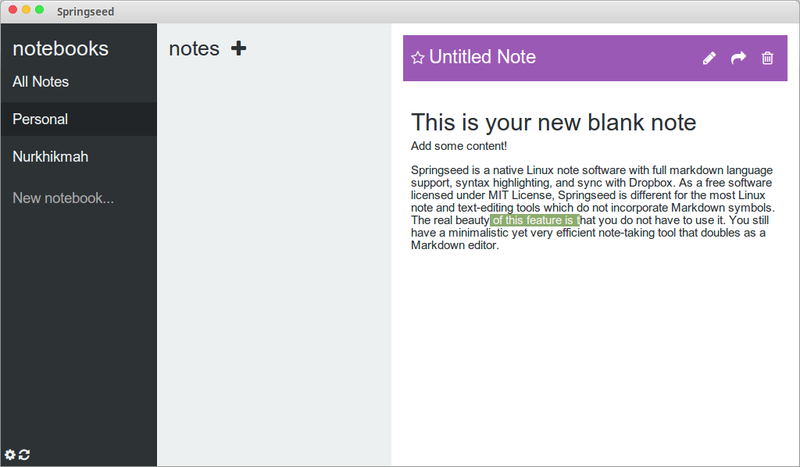 SpringSeed, Alternative Software for Evernote in Linux. Springseed is a simple note taking app with cloud integration for Linux Mint/ Ubuntu and become alternative for Evernote for Linux. How to install Evernote and review about it read here. Springseed is a native Linux note software with full markdown language support, syntax highlighting, and sync with Dropbox. As a free software licensed under MIT License, Springseed is different for the most Linux note and text-editing tools which do not incorporate Markdown symbols. The real beauty of this feature is that you do not have to use it. You still have a minimalistic yet very efficient note-taking tool that doubles as a Markdown editor. With simple and minimalist design, Springseed can create note and store research and personal notes, journal thoughts, code snippets and anything else generated as text. As mentioned above, SpringSeed can synchronize notes between computers using the built-in automatic Dropbox sync feature. This is a very handy process. Just click the tiny gear wheel at the bottom of the app window. Once you add your Dropbox account password, a Springseed folder is installed. Springseed is a note program for Linx with full-featured programs and Web-based services let you do this, but Springseed is self-contained on your computer. Springseed also is a very quick and efficient note-taking tool. By design, it lacks clutter and distractions that take your mind off entering your thoughts. This is a good example of a Linux application that's a super tool for a simple task. Download the packages from its website (click button below) and select your Linux distribution...the 32bit or 64bit then click download button to start downloading the installer file. It will be a deb suffix file and you can install it by double clicking the downloaded file and click "Install Package". You will see main window of this program such as above picture. To use markdown codes in SpringSeed is easy enough. The application includes several basic notes showing the basic Markdown functionality. Look at it and do the same in your notes -- it is that easy. For example, place a hash tag symbol, or #, in front and after a word or string of words you want to display in larger text. This is ideal for writing a title. Use a single asterisk, or *, before and after text you want displayed as italicized text. Use a double asterisk, or **, before and after text you want displayed in bold text. Other symbols will format text with color and various attributes, such as shades of highlighting -- but to learn these, you'll need to find a tutorial. None is provided with Springseed.